It's been a long time since my last post, and I apologize. I know you come here frequently to see if there's something new and I haven't do my job well. So many things happened that went in the way. I was out of town recovering from the surgery and It took me more than I was expecting. It's not the same being at home with all my stuff and my husband helping than in another house, even if it used to be my home. Then I returned and was my baby son got sick and then my daughter and now me. And now my husband it's out of town and my parents are here, but they get tired and I have to take care of many things at once that by 9 or 10 pm I'm exhausted! I also want to take some pictures of myself to show you the progress... so far I've lost more than 40 pounds! Can you believe it!?!?! I think that's what my daughter weights... anyway, I'll try to take some and show you. But enough of excuses, I still have managed to do a little work and I wanted to share it with you. 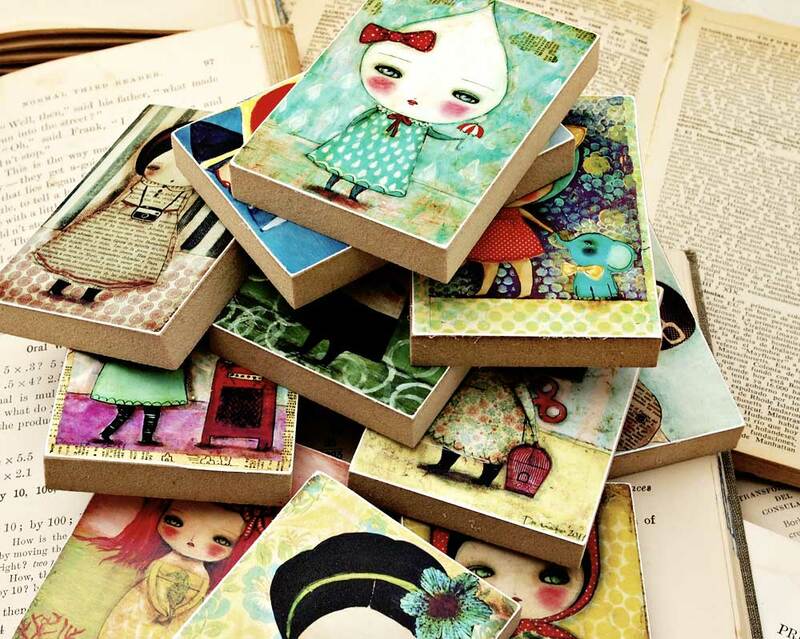 First, I made some ACEO size woodblocks. They're the perfect size to collect (2.5 x 3.5) and they come with a hole in the back for hanging and they can also stand on their own on a shelf or at your desk. And I finally got the 1 inch mini pin back buttons! I've wanted to get some for some time now and I'm very happy with them. They're extremely cute! So cute! Hope you and your family continue to get better. 40 pounds - wow!! Your new work is gorgeous. I'm so sorry to hear about you and your family getting sick. I hope you are all well soon! Also, I'm glad that the surgery seems to have been going well for you. I hope that you are able to recover and feel your best soon! Precioso, espero que todo este mejor, y verte mas seguido.